What potatoes are best for Hash Browns? 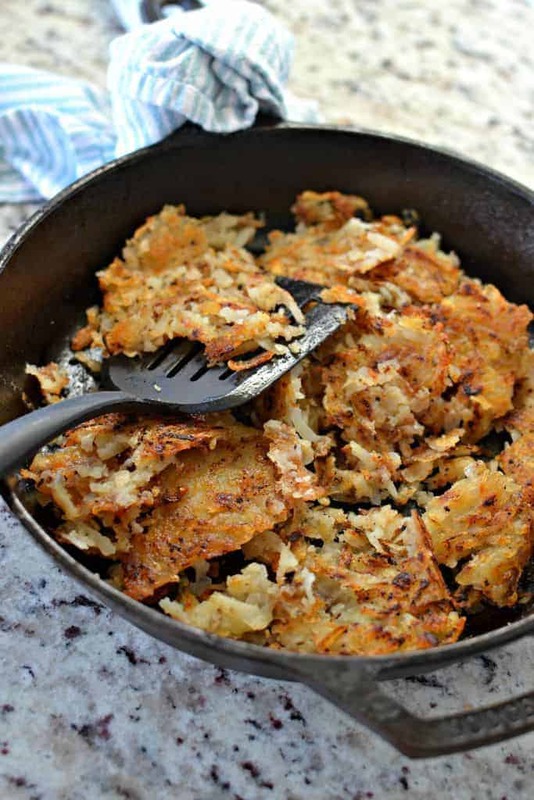 Good ole Russet Potatoes are the best for crispy Homemade Hash Browns. These starchy potatoes ensure good crisp brown edges. You can use waxy potatoes like Yukon Golds if you want assurance that they will stick together but they will not get as crispy as Russet Potatoes. 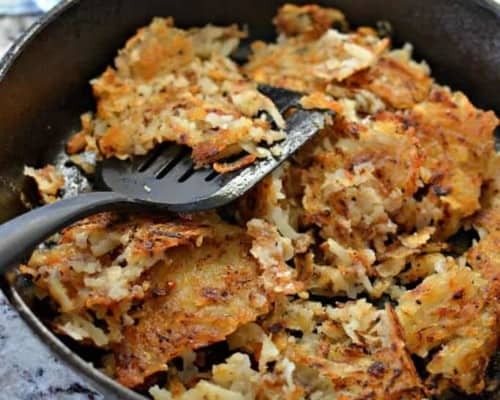 What is the best oil to cook Hash Browns in? My personal preference is bacon grease because the shredded potatoes brown so well in it. The potatoes also absorb up some of the fabulous bacon flavor and the little brown bacon bits cook up in the potatoes. Can you say yummy? You can also use canola oil, vegetable oil or clarified butter with excellent results. What kind of pan is best for cooking Hash Browns? I have found the best pan for cooking hash browns is a large nonstick skillet. You can also use a well seasoned cast iron skillet or a seasoned griddle. Just use a little bacon fat or canola oil and don’t worry if they stick a little bit because that makes for nice crispy bites. 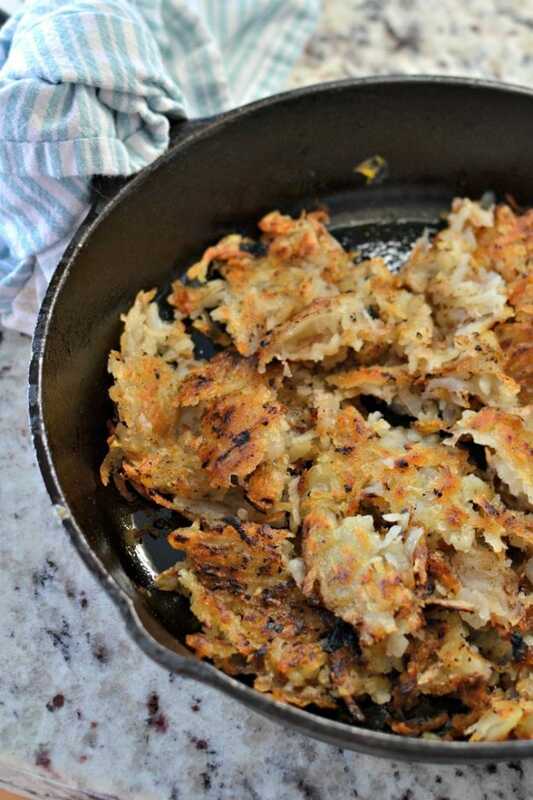 How do you make Homemade Hash Browns? Start by boiling your potatoes for ten minutes then plunge into ice cold water to stop the cooking process. Let them cool before shredding. You can do this step up to several days in advance and just store them with the peels on in the fridge. Peel the potatoes and shred with a box grater or a food processor with your shredding attachment. Soak the shredded potatoes in cold water. Stir to release the starch. I usually soak them for at least thirty minutes. This will aid in the browning and cooking process. Drain that water by pouring the potatoes through a colander or strainer. Soak the potatoes again in cold water for about thirty minutes. Stir to release some more of the starch. Drain the potatoes in the colander. Scoop the drained potatoes into a clean towel or cheesecloth and squeeze out as much excess water as possible. You can also use paper towels but the shredded potatoes like to stick to them. It is very important to squeeze out as much water as possible so when you think that you have squeezed enough go back and do it again. Add about two tablespoons of bacon fat or canola oil to a nonstick or well seasoned skillet over medium high heat. Swirl the fat to coat the pan. Add the shredded potatoes in an even layer and season with salt, fresh ground black, onion powder, garlic powder, paprika and ground cayenne pepper. Press the potatoes down in the pan and cook for about ten to fifteen minutes. The first five minutes should be undisturbed. After that you can lift the corner and see if they are browning but try not to disturb them too much. Once they are golden brown cut into sections, flip and do the same on the other side. Serve promptly as they are best right out of the pan. 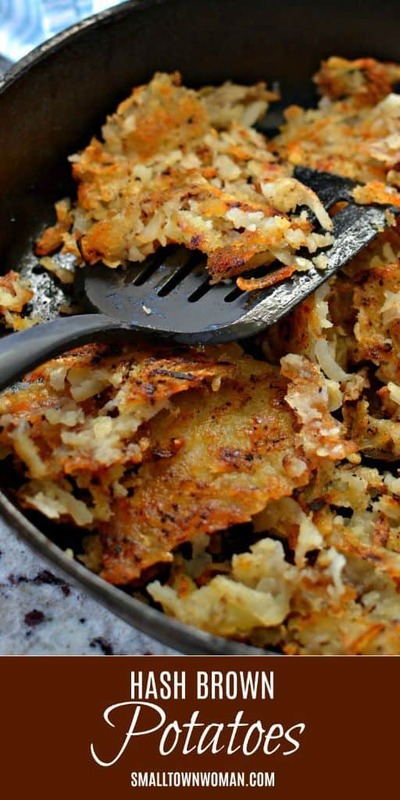 Helpful hints for making the best Homemade Hash Browns. 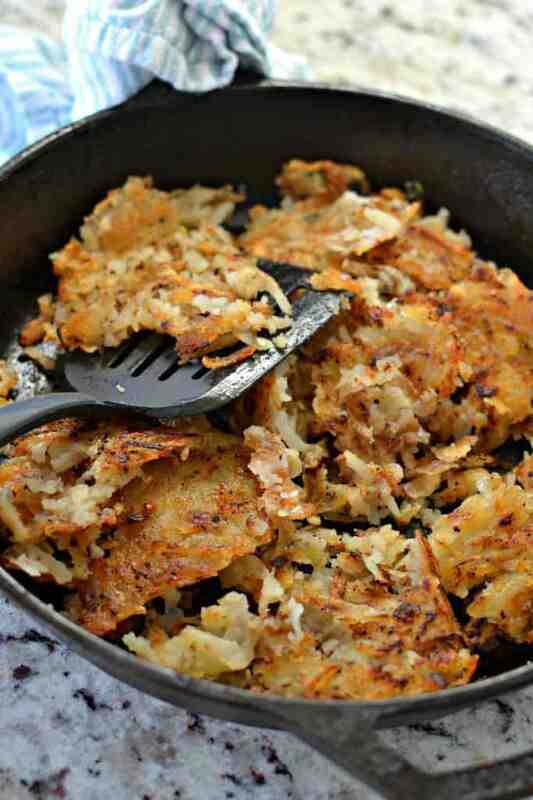 If you want crispy hash browns start with good old Russet Potatoes. Precook your potatoes by boiling for ten minutes or microwaving for two minutes. This helps ensure that the hash browns will be cooked all the way through. Soak the potatoes in cold water stirring to release the starch. Drain that water and soak again stirring to release the starch. This aids in the browning process. Make sure you dry your potatoes thoroughly. I can not overstate the importance of removing as much moisture from the shredded potatoes as possible. Once you dry the potatoes, dry them again. Cook them undisturbed until good and crispy. Check by lifting up a corner. If they are not golden brown leave them undisturbed for a few more minutes. 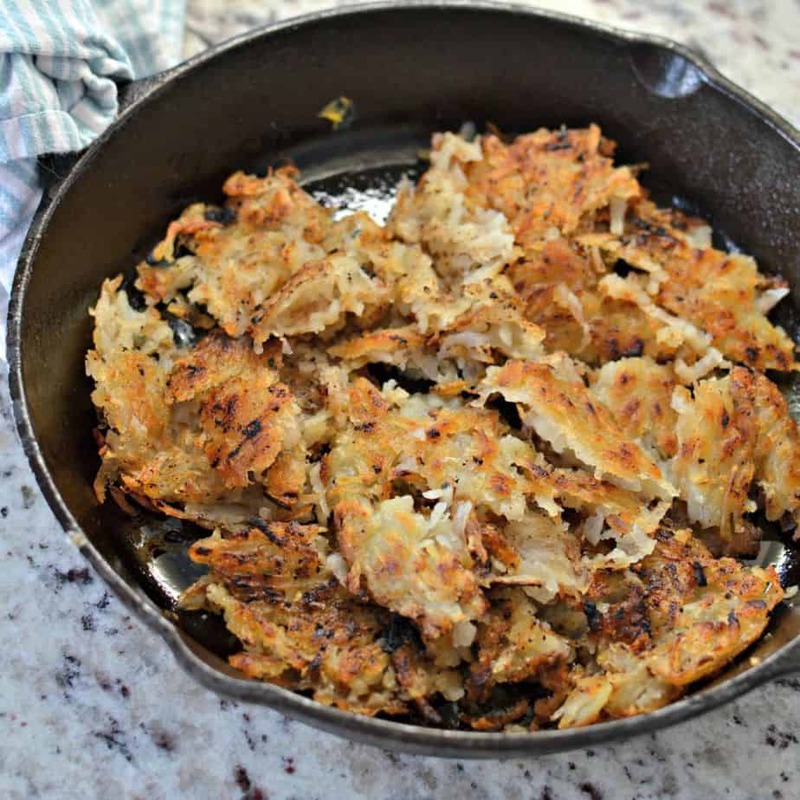 So now you are armed with the information to make some delicious crispy Homemade Hash Browns! Why not prepare now by boiling your potatoes and storing them in the refrigerator? 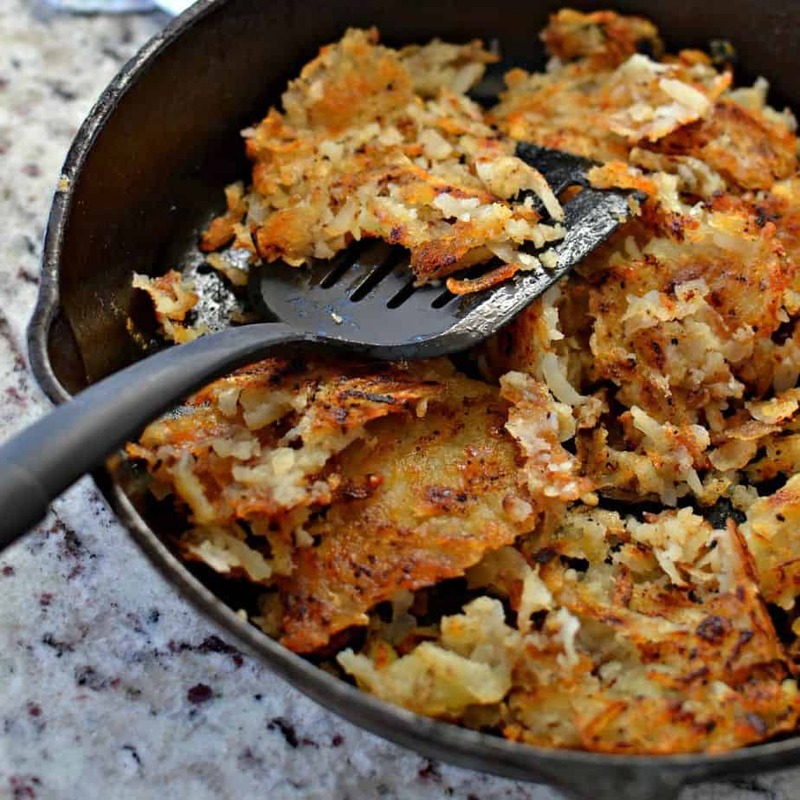 What are you going serve with your delicious crispy Hash Brown Potatoes? How about eggs over easy, sausage, bacon, maybe even some scrumptious Easy Homemade Biscuits and Gravy. You haven’t lived until you have poured sausage gravy over your hash browns. Other potato recipes you will love!